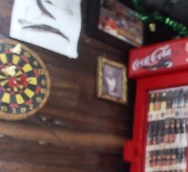 A birdfeeder that looks like a Newfoundland pub, streaming live on the Internet. Inspired by the amazing and delightful Piip Show from slow-TV masters, NRK. NRK have, for past few years, been doing these really cool slow-TV broadcasts. For example: They put a camera on the front of a train that went up the Norwegian coast for 10 hours or something and broadcast that. They had a 12-hour knitting event that was just people knitting. And last year they had a 24-hour live web stream of a bird feeder that looked like a scandinavian café. Wild birds would come to the feeder and look like they were huge birds in a human-sized café, and I loved it. I would watch it all the time, just leave the window open on my computer, and whenever there was a bird that came on screen it was super exciting... but it was just a bird feeder. Putting them in that café made their behaviour relatable, though, like it was a soap opera, like they were characters in this really bizarre, silent television show. It felt like a real window into the life of these wild birds too. I really wanted to do something similar for Newfoundland. When it really hit me that Piip Show wasn't happening again this year, that really gave me the push to set this up. Only kind of related, but whatever: My dad, Jon Lien, was an Animal Behaviourist, a professor at Memorial University here in Newfoundland. He was well-known for his work with whales, but really he started out doing research on wild birds. He’d love watching the juncos from our kitchen table at our house in Portugal Cove, and I was always amazed at how he seemed to be able to understand what was happening out there, how they were interacting with each other, just from paying close attention. Sometimes he’d even take his students out to our house to watch and record the behaviour of the juncos and jays and chickadees. Anyway, he passed away five years ago, and as a little tribute to him there's a whale poster he published with his Whale Research Group up in the corner of the pub. Anyway, hope you like this pub, Mefites! It has a karaoke machine!! OMG, I put this up on my second monitor and was so disappointed that there were no birds....but the moment a bird showed up I swear my heart actually jumped from happy. Also, why haven't any of the birds tried to take the little red garland for their nests? This is the greatest, thanks stokast. Oooh ... I sent the FPP to my friend (who grew up in Newfoundland) and she was stoked. Just figured out it was from projects now I can send her this! !